Left over fruit? Wilted veggies? Recycle, and have some shooting fun! 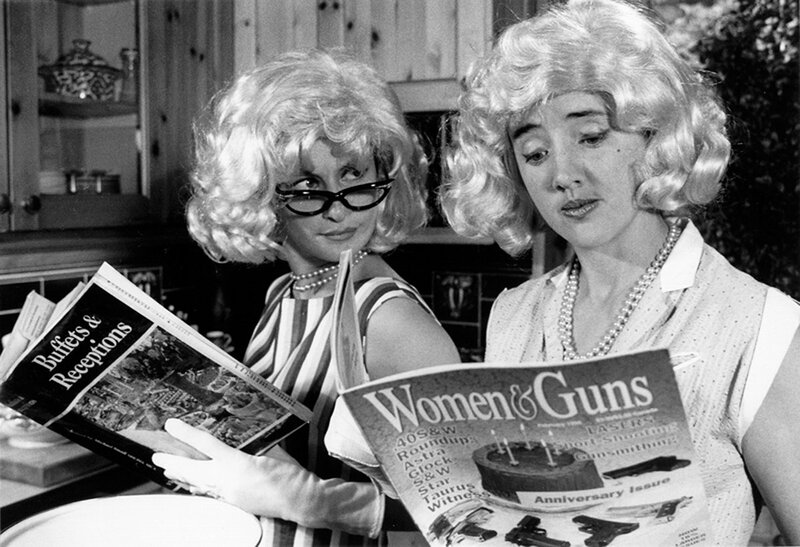 Taking its title from a feature story in the American magazine Women & Guns, Three Semi-Automatics Just for Fun was an exploration of the US vogue for pistol packing wives and mothers as frontswomen of the National Rifle Association and guardians of ‘family values’. The first half of the script for the performance was drawn verbatim from the magazine which juxtaposed beauty and fashion tips with easy-to-remember jingles such as: ‘two to the body, one to the head: guarantees they’re really dead’. The performance focused on pro-gun attitudes and political trends concerning women and on the personal fears and vigilante fantasies that fuel American gun culture. Curious created an accompanying installation of Women and Guns magazines.